It feels great to get back to piecing after all the applique on the Happy Halloween quilt top. I have started sewing the blocks for the One Block Wonder. All the curves in the fabric are going to make wonderful blocks full of movement. 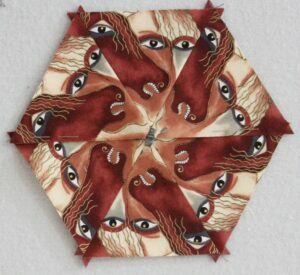 It is fun to compare the kaleidoscope blocks with the original fabric. This is one of my favorite blocks so far. Right now I am thinking about adding some full hexagons from the original fabric into the quilt top, but the final decision will be made when I start arranging the blocks. I also started a new leader/ender project – Four Patchwork by Temecula Quilt Co. The quilt will finish at 48″ x 56″ unless I add borders. 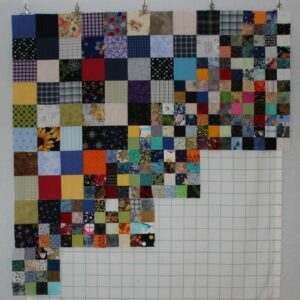 The quilt starts with larger blocks in the upper left hand, progress to medium squares through the middle and will end with smaller square in the lower left. I saw this sew-a-long on the Temecula Quilt Co blog this summer, but now the pattern is for sale in their store. Yesterday my 18 month old granddaughter was holding a cracker in each hand and trying to carry her sippy cup in her teeth – it didn’t work so well. There is always an adventure here on Tuesdays and I am so blessed to experience it with her. That will be a beautiful OBW! Kids — very resourceful.